Exponential’s Toronto team attended the CMDC (that’s Canadian Media Director’s Council) 2017 20/20 Vision conference on April 25th to get the scoop on artificial intelligence, privacy, business and entertainment from world-renowned industry speakers. 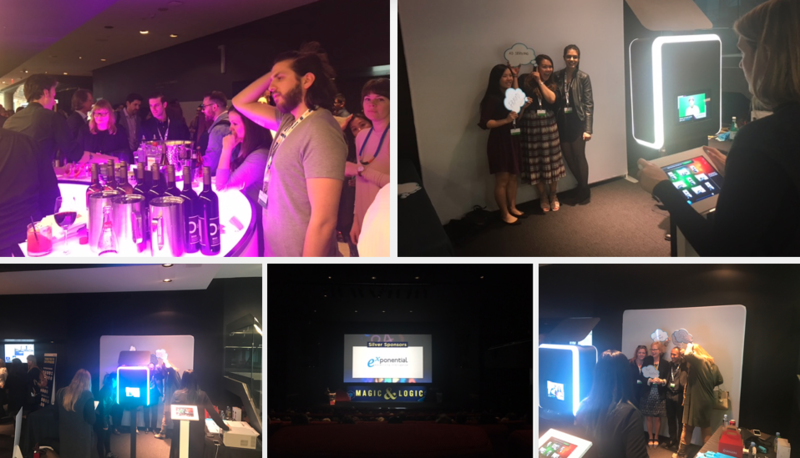 This year’s conference theme, “Magic & Logic”, represents “the perfect intersection of creativity and science – the place where great ideas happen; the ultimate equation.” We asked the team to share insights from their CMDC experience, from trending themes to what they saw on the show floor. Read more below! What was the biggest trend or theme you noticed at this year’s CMDC conference? Any buzzwords? Jillian Dunn (Managing Director, Canada, Exponential): AI was definitely the buzz word around the conference. There was a focus around machine learning and of course, an emphasis on video – looking at where we are today, where we are headed and how the way we work today needs to change. Vi Lieu (Account Manager, Exponential): Simliar to Jillian, I think machine learning and AI were the big buzzwords during the conference. Geoffery Hinton [VP Engineering Fellow, Google] and Tomi Poutanen [co-founder, Layer 6 AI] participated in a very interesting panel discussion about neural networks and how this foundation of AI is incorporated into smart cars, instant language translation, facial recognition and more. Can you reveal some of the intel you learned on how creativity and science will impact media in the next year? What’s in store for the future of advertising? Jillian: The constant message in regards to “Magic & Logic” was that AI still requires humans. The machine can’t explain what it doesn’t understand and people are still needed to give context or tell a story with that data. People need to also know when and how to reject the data when what it is telling them couldn’t be possible or doesn’t make sense. We still need to go with our gut sometimes. This stands true for media. AI doesn’t have to replace humans; it can change humans and the way we do things. Also covered in regards to the future of advertising – the death of mass marketing is a myth. Broad reach is essential to long–term growth. Brands still need to invest money into long term branding and awareness to stay alive. If we live in the short term, we will die in the long term. What would you say is the most important or interesting thing you learned at CMDC? Vi: The presentation by Samantha Nutt [medical doctor and founder of international humanitarian organizations War Child Canada and War Child USA] delved into the topics of war, international aid, and foreign policy – I think it surprised most of the audience, with respect to the dichotomy of first world foreign aid and arms dealing. Jillian: It was interesting to learn that 90% of information transmitted to the brain is visual. We process images 60,000 X faster than text. One minute of video is equal to 1.8 million words. Exponential sponsored a photo GIF booth at the event, but was there anything else you saw on the conference floor that you found particularly innovative, exciting or novel? Jillian: There was an interactive VR booth on the show floor that garnered a lot of attention. Another vendor had a dog dressed in an elephant costume with the team walking it, wearing shirts saying “Let’s Talk About The Elephant In the Room”, driving attendees to the booth to talk about the myths of mobile ad tech. Playing on the “Magic & Logic” theme, one sponsorship included mind readers and a magic potion-type drink for the cocktail sponsorship. Vi: Agreed, the virtual reality and augmented reality booth by Camber Media and their partners was very entertaining. The virtual reality device was similar or the same one used on The Tonight Show’s 3D Pictionary game. Many thanks to Jillian, Vi, and the Toronto team for sharing their insights from this year’s CMDC experience!